Yes... you read that title right... I am grateful for depression and anxiety. What struggle am I grateful for? Tonight, I sat on the floor beside an 8-month old pet chicken that I'd raised from when she was 2 days old... and I saw her take her final breaths. She was a gift for our 4 year old granddaughter last Easter. BUT, I had done the hard work to get that chicken to a healthy 8-month old pullet. She'd recently begun laying tiny little white eggs. She was our only "girl" to lay white ones. Last spring, I held one of our hens in my arms as she took some of her final breaths. It was late at night. I fed her water from a medicine dropper. I put soft food by her beak while she licked it. She didn't make it through the night. She'd been my little buddy - who would always come to check in with me every hour or so while they were out free-ranging. I sobbed when she was gone. A little over 15 years ago, I sat beside my father, kissed him on the forehead and whispered some words of comfort and promise. I held his hand as I listened to him exhale that last breath of air. In that moment, I was absolutely broken yet, at the same time absolutely certain that he was in a better place. I had watched his body be ravaged by cancer for the past 7+ months. I had accompanied him & my mother on multiple medical visits. I'd sat by him in a critical care room one night when we were certain the end was moments away. How can I possibly write about the death of two pets and my own father in the same post? It seems ridiculous... disrespectful... bizarre. But, tonight as I watched the life ebb away from my pullet, "Maggie", I thought of the peace that prevailed as my own father left this earthly life. And, I thought about how precious life is -- even for animals. When my father passed, I could do nothing to prevent what happened. I went into those last moments believing & knowing in my heart of hearts that God could have healed & restored his body in the blink of an eye. I knew that either his healing here on earth or his healing by passing into heaven would be quite a transition from where he was in those final moments. 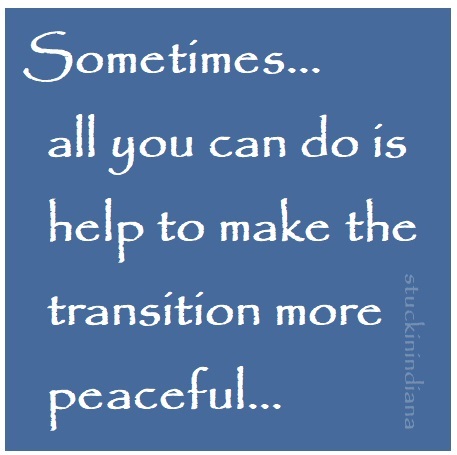 All I wanted to do was bring peace to the moment... the moment of transition. And, tonight I was reminded once again that life is full of transitions. We transition from being young to being old. We transition from being child to parent. We transition from able-bodied to broken. We transition from being children to being adults. Some transition from being rich to being poor (and vice versa). Some transition from being single to be being married... to being single. My mother transitioned from being a secure, nurtured wife to being an unsure & somewhat scared widow -- as my father breathed his last breath. Life is anything but stationary. It's full of transitions. Some seem happy. Others seem sad. 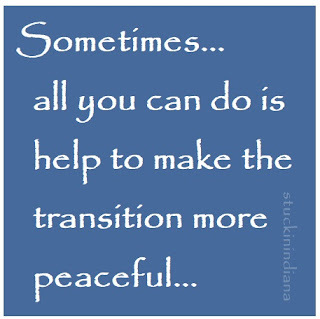 May we walk with those around us... and help to make some of those transitions more peaceful.